Mercaptopurine belongs to the group of medicines known as antimetabolites. It is used to treat some kinds of cancer. Mercaptopurine interferes with the growth of cancer cells, which are eventually destroyed. Since the growth of normal body cells may also be affected by mercaptopurine, other effects will also occur. Some of these may be serious and must be reported to your doctor. Other effects may not be serious but may cause concern. Some effects may not occur for months or years after the medicine is used. Before you begin treatment with mercaptopurine, you and your doctor should talk about the good this medicine will do as well as the risks of using it. Mercaptopurine may also be used for other conditions as determined by your doctor. 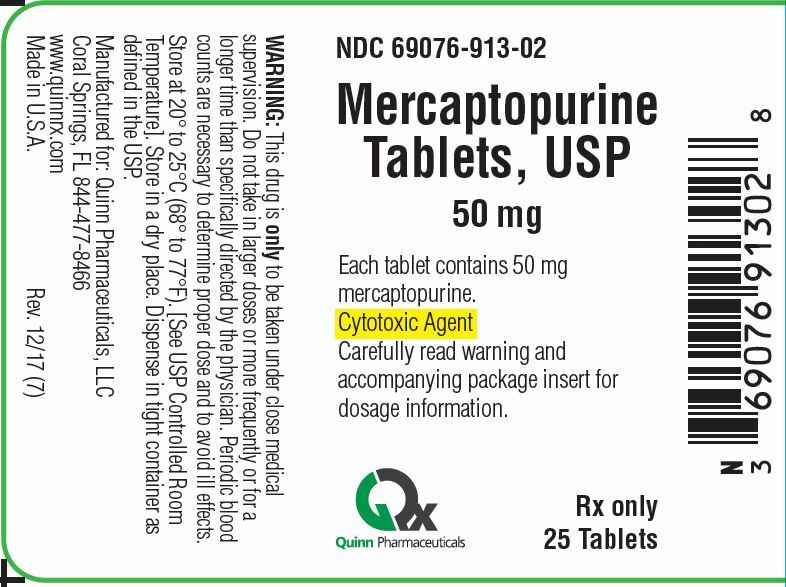 Mercaptopurine is available only with your doctor's prescription. Although there is no specific information comparing use of mercaptopurine in children with use in other age groups, it is not expected to cause different side effects or problems in children than it does in adults. Many medicines have not been studied specifically in older people. Therefore, it may not be known whether they work exactly the same way they do in younger adults or if they cause different side effects or problems in older people. There is no specific information comparing use of mercaptopurine in the elderly with use in other age groups. Use this medicine only as directed by your doctor. Do not use more or less of it, and do not use it more often than your doctor ordered. The exact amount of medicine you need has been carefully worked out. Taking too much may increase the chance of side effects, while taking too little may not improve your condition. Mercaptopurine is often given together with certain other medicines. If you are using a combination of medicines, make sure that you take each one at the right time and do not mix them. Ask your health care professional to help you plan a way to remember to take your medicines at the right times. While you are using mercaptopurine, your doctor may want you to drink extra fluids so that you will pass more urine. This will help prevent kidney problems and keep your kidneys working well. If you vomit shortly after taking a dose of mercaptopurine, check with your doctor. You will be told whether to take the dose again or to wait until the next scheduled dose. Avoid alcoholic beverages until you have discussed their use with your doctor. Alcohol may increase the harmful effects of this medicine. While you are being treated with mercaptopurine, and after you stop treatment with it, do not have any immunizations (vaccinations) without your doctor's approval. Mercaptopurine may lower your body's resistance and there is a chance you might get the infection the immunization is meant to prevent. In addition, other persons living in your household should not take oral polio vaccine since there is a chance they could pass the polio virus on to you. Also, avoid persons who have taken oral polio vaccine. Do not get close to them and do not stay in the same room with them for very long. If you cannot take these precautions, you should consider wearing a protective face mask that covers the nose and mouth. Tell the doctor in charge that you are taking this medicine before you have any medical tests. The results of tests for the amount of sugar or uric acid in the blood measured by a machine called a sequential multiple analyzer (SMA) may be affected by this medicine. The information contained in the Thomson Reuters Micromedex products as delivered by Drugs.com is intended as an educational aid only. It is not intended as medical advice for individual conditions or treatment. It is not a substitute for a medical exam, nor does it replace the need for services provided by medical professionals. Talk to your doctor, nurse or pharmacist before taking any prescription or over the counter drugs (including any herbal medicines or supplements) or following any treatment or regimen. Only your doctor, nurse, or pharmacist can provide you with advice on what is safe and effective for you. The use of the Thomson Reuters Healthcare products is at your sole risk. These products are provided "AS IS" and "as available" for use, without warranties of any kind, either express or implied. Thomson Reuters Healthcare and Drugs.com make no representation or warranty as to the accuracy, reliability, timeliness, usefulness or completeness of any of the information contained in the products. Additionally, THOMSON REUTERS HEALTHCARE MAKES NO REPRESENTATION OR WARRANTIES AS TO THE OPINIONS OR OTHER SERVICE OR DATA YOU MAY ACCESS, DOWNLOAD OR USE AS A RESULT OF USE OF THE THOMSON REUTERS HEALTHCARE PRODUCTS. ALL IMPLIED WARRANTIES OF MERCHANTABILITY AND FITNESS FOR A PARTICULAR PURPOSE OR USE ARE HEREBY EXCLUDED. Thomson Reuters Healthcare does not assume any responsibility or risk for your use of the Thomson Reuters Healthcare products.